The handsome actor/former journalist/religion correspondent/author Abdiel LeRoy is a British-American whose life is largely inspired by the Bible, Shakespeare, and the great epic poem, 'Paradise Lost'. 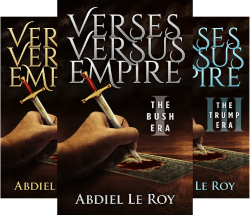 As a poet Abdiel embraces giant tasks – the lives of Elijah, Obama, Bush, and Trump in his VERSES VERSUS EMPIRE series, as well as the very fine DUELING THE DRAGON, THE GOURMET GOSPEL, THE CHRISTMAS TREE and now WELL VERSED. He also has worked as a broadcaster, financial analyst, and market commentator, while his passions also include Argentine Tango, Yoga, and competitive swimming. His voice both as a narrator for dramatic readings and on stage is being recognized as a brave new presence in the politics of the globe. 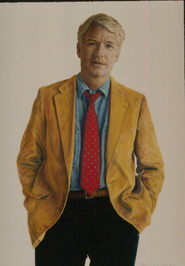 As an actor, Abdiel has embodied most of the major Shakespearean roles, and on stages from New York to London to Beijing, though perhaps his most famous appearance is in the hit short-film series, ‘The Expert.’ He has also staged three one-man shows, including the famous children's tale, ‘Wind in the Willows. This series of book shares insights into the way our country has altered over time, viewpoints that Abdiel divides into THE GEORGE W. BUSH ERA, THE OBAMA ERA and THE TRUMP ERA. Abdiel’s wisdom and insights as well as his keen sense of theatrics allow us to consider the state of affairs in this ‘empire’. A different stance and view and only history will reflect the truth of it all. In the TRUMP ERA book he includes his poetry, and as a poet Abdiel embraces giant tasks, and here emerges as a brave new presence in the politics of the globe. His wisdom and insights, as well as keen sense of theatrics, allow us to consider the state of affairs in this "empire". Sad, frightening, but true.